It might be finally getting a proper release - 10 years later. 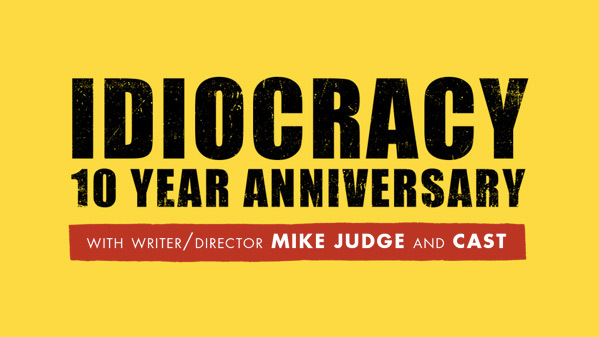 20th Century Fox is letting theaters screen the cult comedy Idiocracy, from writer/director Mike Judge, in theaters later this year just before the election. The Alamo Drafthouse chain has at least 25 of their cinemas listing a screening on October 4th, and more theaters across the US are being listed as well. Idiocracy is the sci-fi comedy from Mike Judge about an average guy, played by Luke Wilson, who is frozen and wakes up in the future - only to discover it's an idiotic place with Terry Crews as President Camacho running the country, and Brawndo being distributed instead of water. It's a totally wacky comedy, but it's also becoming increasingly prescient - especially with a buffoon as idiotic as Camacho in the running for President. Glad to see Fox letting this film back in theaters. Thanks to THR and SlashFilm for the info on the re-release. When Idiocracy was first released in late 2006, Fox barely played it in theaters (there was a controversy about them being afraid of putting it out because it was so dumb) - I had to drive an hour outside of Los Angeles just to find the one cinema showing it. Now they're giving audiences a chance to come see it (again) 10 years later. "The Alamo Drafthouse, along with the network of Arthouse Convergence Theaters and local League of Women Voters chapters, want to invite everyone to revisit and rediscover Idiocracy on the eve of the 2016 presidential election." For more info on the Alamo Drafthouse screenings, which include a Q&A after, head to Drafthouse.com. Mike Judge and Terry Crews were planning to make some election commercials this year, but they ended up being canned. This re-release might be a nice alternative. And if you've never seen this film, you might as well check it out. Fox sure fucked up in the first place. I think this is Mike Judges best work ever. It was one of my favorite comedies ten years ago, these days it's a little too real. This movie is a bit like reading Youtube comments. Though, it really isn't that far off reality, the wrestler president isn't that so far away from the orange man in the running at the moment. I won't bite next time. I agree, Hillary is a buffoon. Right, right... Whatever you say. It's obvious who the real idiot is in this election. Calling him idiot is flattering. Cretin is more appropriate. I prefer the term "charlatan", personally. A charlatan is a guy who could fool you with pseudo-knowledge. A Con if you prefer. This clown fools no one. If you remove from him his money, I would be surprised if he will find any audience, except in an asylum. Yes. Exactly. He tells his supporters pseudo-knowledge about women, Muslims, and immigrants. He is a charlatan, but, a charlatan for idiots, if you, yourself, would prefer. Now, I think we should get back to filmmaking and the like, shall we? Thanks. Thanks for the reply Mark. Yes, Trump deserves not further attention of ours. Cheers. Seriously, I dont understand how Hillary is running either! She is a fan of Forrest Gump I suppose. This is a documentary, right?